GOLD PRICES popped to 1-week highs in London trade Friday, rising to show a small gain for 2019 to date at $1285 per ounce as geopolitical tensions worsened over Venezuela and the United States' relationship with China. Silver prices also halved last week's drop to trade just below $15.50 per ounce, while platinum popped to $811, trading 1.7% above last Friday's finish. Global stock markets rose yet again, extending the last month's gains to 10.6% in Tokyo, 7.5% in Hong Kong, and 6.1% across Western Europe. But with just 32 working days left on the UK Parliament's schedule before 29 March however, and with France's finance minister Bruno Le Maire today rejecting calls for the European Union to compromise to avoid a 'hard Brexit', London's FTSE100 index in contrast has rallied barely 2% since this point in December. 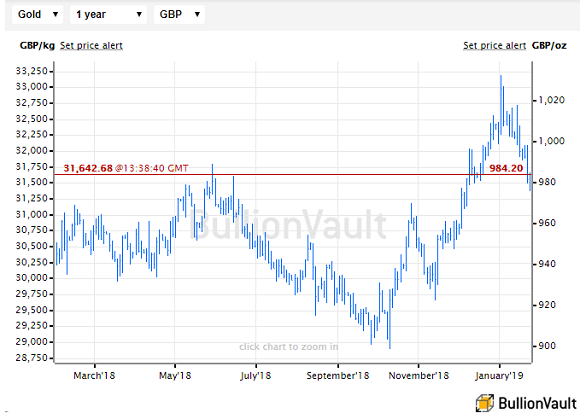 Euro gold prices rose with €5 per ounce of New Year's 19-month high of €1138, but UK gold prices in Pounds per ounce held a 1.1% drop for the week as Sterling traded near 11-week highs on fresh chatter about the opposition Labour Party pushing for a second referendum on Britain remaining in the EU. Crude oil meantime held unchanged from last Friday's finish, " partially pricing in the risk to Venezuela's crude production" according to one analyst as the United States threatened fresh sanctions against the crisis-hit Latin American state unless elected ruler Nicolas Maduro steps aside for self-declared "interim president" Juan Guaido. The United States is "meddling... just pouring gas on fire," said a spokesman for the government of Russia, now with $20 billion of loans and investments in Venezuela on some estimates. Turkey is meantime importing and processing "tons of Venezuelan gold, mined in horrendous conditions overseen by the military," according to the Israel's Haaretz newspaper. Beijing today said it "urges the US to abide by the agreed One-China principle" after Washington sent 2 warships through the Taiwan Strait on manoeuvers. Foreign trade through China's No.1 port rose 5.1% last year to a new all-time high year-on-year to a historic high above $1 trillion, data from Guangdong province said Friday. "More than the trade war, we think the recent slowdown [in China's economy] is due to the ongoing effect of non-bank deleveraging," says a commodities note today from Chinese-owned bullion bank ICBC Standard. "So far [however] the market has only really questioned when rather than if [new government] stimulus will be forthcoming," ICBC Standard goes on, warning that "[because] China is not currently experiencing the implicit deflation that occurred in both 2008 and 2015...it may be that significant stimulus will not be forthcoming unless or until growth slows to a level akin to these previous troughs. "Q1 could prove a test of investors' collective patience." Shanghai gold premiums ended the week $12 per ounce above London quotes, offering a solid incentive for new bullion imports into the world's No.1 gold consumer nation 2 weeks ahead of the key Chinese New Year holidays. But again, "as we have become accustomed to seeing, the metal failed to break outside of [its] recent range amid muted interest," says a trading note from bullion refiners MKS Pamp. After lambasting tech giants like Facebook in his speech last year, "China is not the only authoritarian regime in the world but it is the wealthiest, strongest and technologically most advanced," said billionaire speculator and philanthropist George Soros at the World Economic Forum in Davos today. "This makes Xi Jinping the most dangerous opponent of open societies." "One should not ask the whole world," said a speech from China's vice-president Wang Qishan this week, "to address only the security concerns and comply only with the standards of developed countries or individual nations." Over in the US meantime, long-time adviser to Donald Trump Roger Stone was today arrested on 7 criminal counts around obstruction of justice and witness tampering related to the FBI's investigation of alleged Russian collusion in Trump's winning 2016 presidential campaign.